Well, here it is, my finished Christmas quilt! I started dreaming about making this quilt sometime early in 2009 when the previews for the Figgy Pudding fabric line by Moda started showing up on online fabric shops. Sometime in June, I noticed the fabric was available to buy online, and I called my local quilt shop to ask which Christmas fabric lines they had. They did have the Figgy Pudding line so I went and bought a few fat quarters to get started with. Then I bought more of the fabric when I was on vacation in Utah. I believe I made the quilt blocks and pieced strips on the back with 17 assorted fat quarters and then I purchased additional yardage for the sashing, binding, and solid backing fabric. 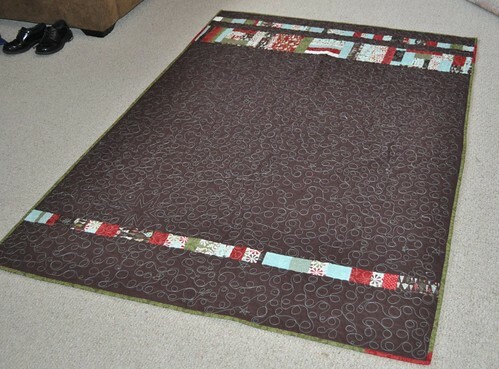 The back is made up of pieced strips of my Figgy Pudding scraps, and the brown solid is a Quilter's Only fabric from JoAnn's. It is quilted with aqua colored silk/cotton thread by Mettler. Number 0905 (I had to go back to buy more thread a couple times, plus it is the same thread I used on my mendocino mermaid baby quilt. I have about 5 empty spools with 0905 on them, time to move on to another thread color!) This is the second quilt I've quilted with my new sewing machine, and I have figured out that I need to adjust my top thread tension to around 6.5 or 7 in order for the stitches to come out right. I thought I had enough of the green damask print to bind the quilt but I ended up a little short, so I put in a few little red sections of binding. Here's a close up of one of my favorite blocks, and the star. I love the blue Christmas tree fabric so much. And the red and white fabric, too. This quilt is made from my Simple Squares pattern which is a free tutorial-in-progress. In the coming weeks I will be finishing up the instructions for the sashing and getting the fabric requirements for the larger quilt all figured out, so you can make your own quilts with this pattern. Stay tuned! This is such a wonderful quilt. I think it's my favorite Figgy Pudding quilt I've seen yet. I love the blue sashing and the brown on the back. Lovely. Just gorgeous! 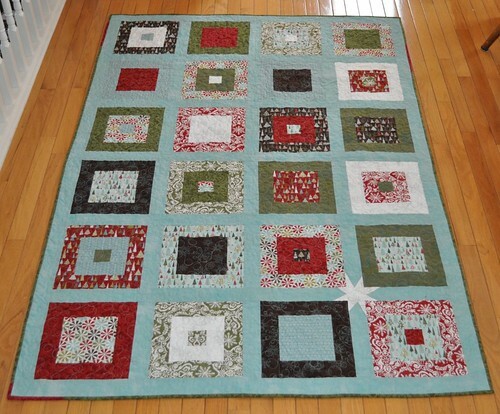 I have been watching it's progress and want to do a Christmas quilt next year! The blue and brown work so well. I love it all, but especially that little white star. 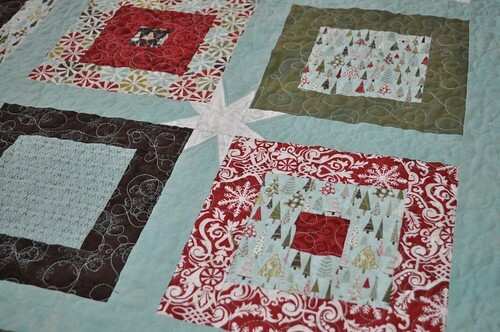 I love the star... so perfect for a CHRISTMAS quilt! Love it love it LOVE it! Especially the star, just the right amount of unexpectedness! I love this quilt. can't wait for the tutorial..the added star is the perfect touch! It's a beautiful quilt! Nice work. Wonderful! Even after spending months with Figgy pudding, I still love it! And I have plenty, so perhaps one of these would be in my future. The back is perfect with the brown and blue thread - mimics the line's brown snowflake print perfectly. And those little accidents that lead to things like bits of red in the green binding...perfect! It makes the whole thing that much more interesting. Great finish! this looks amazing. what a great pattern and your quilting of it is amazing. I love your Figgy Pudding quilt!!! It is amazing! Wish I had some of the exact same fabric so I could get started when you finish the tutorial!! The star is just a brilliant touch! It's all gorgeous, Vicki! I'd love to see if the Figgy is still available anywhere. I don't have a Christmas quilt and this would be a great one. I popped over from your interview and am putting you on my bloglines for the tutorial. Thank you. Nice quilt. I like the Figgie Pudding fabric too. I left a comment on Natalia's blog and thought I would pop over here and say Hi. I live about 90 minutes west of you. Love, love, love your quilt and the star is just the right touch!!! The fabric is wonderful! These are great colors together, your quilt looks wonderful! Your quilt is very wonderful. I love the figgy pudding fabric. The little star is the star of your quilt! can i ask how big this is and how big the squares are? i love the pattern and it looks like a great size! The finished squares are 10". 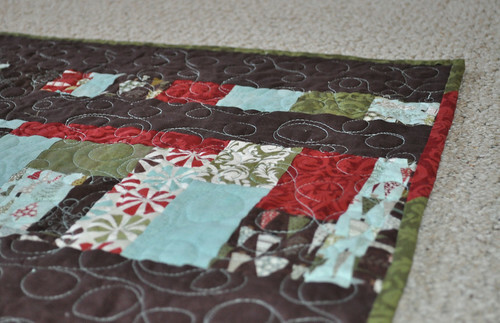 Look at my quiltalong in the tab bar at the top of the blog for info on how to make this quilt!